Source: TransGlobe Energy. 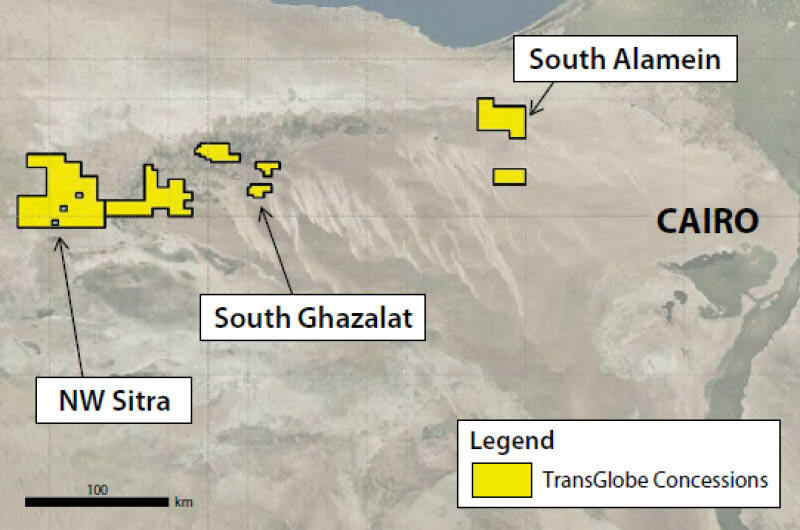 In November 2018 TransGlobe Energy announced a potential light oil discovery with its SGZ-6X exploration well on the South Ghazalat concession in Egypt’s Western Desert, about 300 km west of Cairo. The company has now confirmed this to be a major discovery, having announced that on test the well flowed a combined 3,840 bopd of light (35–38° API) oil from three intervals in the Cenomanian Upper and Lower Bahariya Formations. Based on these positive results, it will begin preparing a development plan for the field. Since 2012 TransGlobe has steadily built up its acreage position in the Western Desert and now has approximately 4,625 km2 covering three concessions: South Alamein, North West Sitra and South Ghazalat, operator in all three. The company committed to a work programme of US$8 million at South Ghazalat in the first phase, consisting of 3D seismic and two wells. It acquired about 400 km2 of 3D seismic during 2015 and with the completion of SGZ-6X has met the financial commitments for the current exploration phase. The 1,414 km2 South Ghazalat PSC is located in the prolific Abu Gharadig Basin, a deep east–west trending asymmetric graben, about 300 km wide and 60 km north–south. Some recommended GEO ExPro reading relating to, or similar in content to, oil and gas in Egypt. Hydrocarbon exploration success offshore Egypt to date is mainly associated with the prolific Pliocene sequence in the Nile Delta Basin, but as the recent Zohr discovery shows, there are other potential plays to follow. Here, we look at the relatively unexplored area of offshore West Egypt. The South Falkland Basin has remained below the industry radar. Pioneering exploration efforts are slowly revealing the potential of this new frontier.